Although the British moors and lowlands are quite different from the Spanish Mediterranean forest, small game shooting takes place in both locations, with this an activity of high socio-economic and ecological value to both countries. Hence, gamekeepers, landowners and scientists from Britain and Spain often deal with similar challenges but, can we learn something from each other for the benefit of game and other wildlife? The Game & Wildlife Conservation Trust is going to participate in the first “Spanish-British Small Game Management Meeting”, to be held in Ciudad Real (the ‘Spanish Norfolk’) on the 25-27th of September. 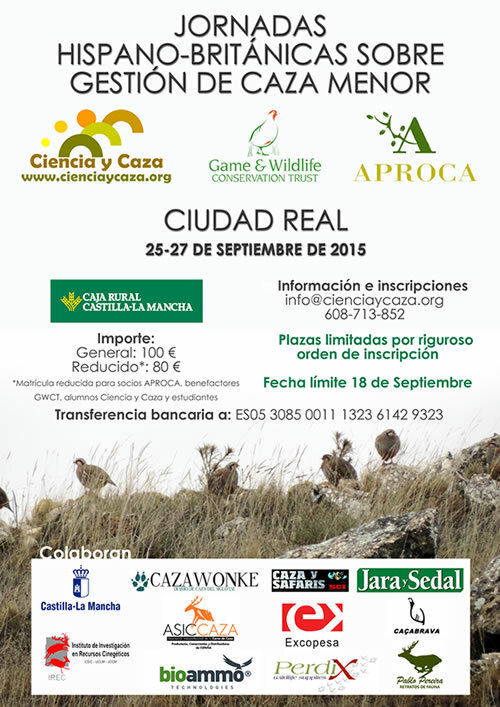 This meeting provides a rare opportunity for an exchange of information about game management and will consist on a series of talks and workshops, together with a field trip to a well-managed shooting estate. Myself, Dr. Nick Sotherton and Dr. Roger Draycott will impart unique advice based on practical experience and science developed by the GWCT, and the same will be done by Spanish scientists and practitioners. The days will involve inspiring talks and practical demonstrations on habitat creation and management, predator control and other techniques. The event will be held in Spanish. If you would like to come to the event or are interested in finding out more information please contact csanchez@gwct.org.uk. You can download the event programme (in Spanish) here.